And speaking of insects, guess what else these nocturnal animals eat? Keep up to date with what's new in the surprising world of bats by subscribing to the blog. A bat box is an easy and fun way to contribute to bat conservation. 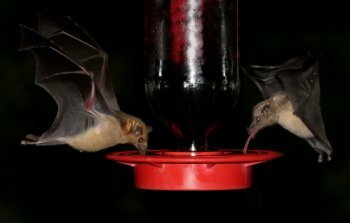 Whether you're thinking of buying or making one, these tips and information will increase your chances of attracting bats. The fruit bat is one of the cutest bats around! But where do they live and what important role do they have in nature? The vampire bat is one of the most misunderstood and feared animals. Discover some surprising facts about them including how they might help find new cures for human diseases. Books on bats are a great way to get an insight into their hidden world. Here are some bat book reviews and please feel free to share your thoughts on any books you've read. Bat wings have enabled bats to be the only mammal to attain true flight. Discover why they're so agile and why they give birds a run (or should that be flight) for their money. If you'd like to contact us, we'd love to hear your comments and suggestions. Would you like to share your knowledge about bats? Great, find out how you can submit your story or tip here.